Our client, Linda M. came to us when her relationship with her husband’s caregiver was in crisis over taxes. Linda’s husband has dementia and needed supervision during the day. Linda lives in New Jersey and she hired the caregiver in the fall and was paying her in cash every week. An accountant handles the couple’s income taxes, and when she hired the home care aide her accountant told her that everyone treats these workers as independent contractors. Linda is the first to admit that she doesn’t understand taxes, and prefers not to deal with them. In her circle of friends, all the families pay cash to their housekeepers. After checking with her accountant, she felt very comfortable with her arrangement. In January, Linda’s accountant helped her prepare a 1099 form to give the caregiver, and that is where the trouble began. The caregiver went to a free tax clinic run by the IRS’ Volunteer Income Tax Assistance program. After chatting with the volunteer about her job, the tax preparer advised the woman that her employer had likely misclassified her as an independent contractor, and that IRS guidance states that home care workers are employees and should receive a W-2 form. Moreover, the volunteer preparer showed the caregiver that the misclassification would cause her to owe an additional $2300 on her income tax return. The volunteer tax preparer was absolutely correct. Senior caregivers paid directly by the family are employees and should receive a Form W-2 at the end of the year. Linda was confused about the distinction between an employee and an independent contractor. She did some internet research and then contacted her accountant. Her accountant explained again that everyone calls their housekeepers and senior caregivers an independent contractor, even though they really are employees.” No one wants to deal with the nanny taxes” he explained, “but if you do I suggest you talk to HomeWork Solutions.” Linda called HomeWork Solutions and received a quick education on why this was important and what her employer responsibilities were. HWS explained that the distinction between employees and contractors is important because employers of household employees such as housekeepers and senior caregivers file and pay employment taxes. Contractors handle their own tax filings. Linda’s accountant had steered her wrong, and there was some catch up Linda needed to do to straighten things out. It was fortunate that the caregiver had only worked for them for a short time. HWS helped Linda to understand what taxes Linda needed to pay. Linda engaged HWS to help her get caught up on the taxes, and signed up for HWS’ household employee payroll service so this could be done effortlessly going forward. Linda agreed to pay her employee’s portion of the Social Security and Medicare taxes – an option available to household employers. Linda convinced the caregiver to allow HWS to do paycheck deductions for her income taxes to help her avoid the stress of a large tax bill in the spring. Since she began working with HomeWork Solutions, Linda has not had a single problem and she credits this with providing her a sense of relief when tax time comes around. Linda’s caregiver is delighted with her direct-deposit payroll, a convenience she has never had before providing private care. On July 15, DOL Administrator David Weil issued an Administrator’s Interpretation that said “most workers [who are classified as independent contractors] are employees under the FLSA’s broad definitions.” This clarification by the government put the final nails in the coffin of the independent contractor myth. According to attorney Cynthia Effinger of McBrayer, McGinnis, Leslie & Kirkland, PLLC, "The defining question in this calculus is whether the worker is truly in a separate business that is independent economically from the employer. If the worker is economically dependent on the employer, the worker is an employee in the DOL’s eyes." 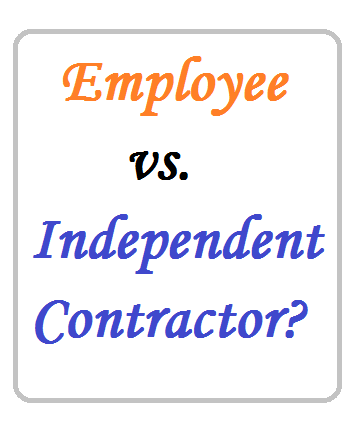 US Department of Labor: Employee or Independent Contractor?